The EPOCH 1000 Series Digital Ultrasonic Flaw Detectors combines the highest level of performance for conventional portable flaw detection with the power of phased array imaging. The EPOCH 1000, 1000 iR and 1000 i feature a new horizontal case style with full VGA display, knob and navigation arrows for parameter adjustment, and full EN12668‑1 compliance. The advanced conventional ultrasonic functionality of the EPOCH 1000 series is augmented in the EPOCH 1000 i with phased array imaging capabilities. The EPOCH 1000 iR provides the same ultrasonic flaw detection capabilities as the EPOCH 1000 with the benefit of upgrading to phased array with simple field-remote activation. The EPOCH 1000 i comes standard with the same advanced ultrasonic flaw detection capabilities as the EPOCH 1000, with the addition of a built-in phased array imaging package. * This product may not be available in your country. Please contact your local Olympus sales representative for more information. 9.92 in. x 6.97 in. x 4.2 in. Adjustable from 15 minutes to 120 minutes with 50% less battery consumption. Tested to MIL-STD-810F, Method 511.4, Procedure 1. Atmosphere defined per NFPA 70, Article 500 as Class I, Division 2, Group D.
The EPOCH® 1000, EPOCH 1000 iR , and EPOCH 1000 i provide advanced conventional ultrasound capabilities for both basic and advanced level users. These portable instruments can also be integrated into small systems for high speed scanning and single- channel imaging and come standard with a host of high performance features, including a 6 kHz maximum Pulse Repetition Frequency (PRF) with single-shot measurements for accurate high-speed scanning applications, tunable square wave pulser with PerfectSquare™ technology, and comprehensive digital filter sets for exceptional signal-to-noise clarity. Adjustable pulse repetition frequency (PRF): 5 Hz to 6 kHz. Single-shot measurements in all standard modes. Tunable Square Wave Pulser with PerfectSquare™ technology. Programmable analog and alarm outputs. Over 30 digital filter set. Digital high dynamic range receiver. Dynamic DAC/TVG - This standard feature enables fast and dynamic creation of DAC curves using reference reflectors, in addition to single-button switching from DAC to TVG mode. Includes ASME, ASME-III, JIS, 20% to 80% DAC, Custom, and TVG Table. Onboard DGS/AVG - The DGS/AVG flaw sizing technique uses calculated attenuation curves to aid you in sizing potential defects. A vast onboard library of characterized probes enables you to quickly and easily setup a DGS/AVG curve and perform precise flaw sizing. Interface Gate - This optional third measurement gate enables real-time tracking of a variable interface echo in order to maintain consistent digital measurements. AWS Welding Rating - This weld rating calculator provides a live AWS D1.1/D1.5 code-compliant "D" value weld rating for gated flaw indications. Floating Gate - This option enables you to "float" Gate 1 and/or Gate 2 at a selected height compared to a gated echo (-1 dB to -14 dB). This feature provides more consistent, precise readings, especially in Edge Detection mode. The EPOCH® 1000 features a new and exciting set of visual enhancement capabilities to improve the quality and ease of detection in advanced applications. SureView® - This feature emulates the functionality of analog CRT displays, allowing you to visualize peak indications from reflectors by adding a point of light along the A-scan trace where every peak occurs. Composite A-scan - This feature uses every A-scan acquired in between screen update rates (multiple A-scans when PRF > 60 Hz) to draw a composite A-scan based on the maximum envelope of all the acquired A-scans. This feature increases confidence of visual detection when scanning quickly. Max Amplitude - This feature displays only the acquired A-scan with the highest gated amplitude reading between screen updates. Baseline Break - This feature displays "zero-cross" points as lines connecting individual A-scan lobes to the baseline in full-wave rectified mode. Min Thickness - This feature displays only the A-scan representing the minimum thickness reading between screen updates. Averaged A-scan - This feature enables you to view the average of the acquired A-scans. Averaging is applied in multipliers of 2x, 4x, 8x, 16x, 32x, and 64x. The EPOCH® 1000 i provides powerful conventional ultrasonic and phased array flaw detection in a portable, rugged instrument. This instrument offers increased probability of detection of flaws, better visualization of areas of interest, and improves inspection efficiency by enabling a single setup to view A-scans at multiple angles (focal laws), thus eliminating the need for multiple probes and wedges. This instrument provides the same reliable and exceptional performance for conventional detection as the EPOCH 1000, with the added benefit of phased array capabilities. The EPOCH 1000 i allows you to perform code-compliant inspections in accordance with conventional standards, with the advantage of phased array for increased accuracy and efficiency. Available with a standard 16:16 configuration and upgradable to 16:64 configuration via software, the EPOCH 1000 i also includes many sizing features to facilitate in flaw inspections. The instrument comes standard with A-scan and S-scan reference and sizing cursors for flaw-size evaluation. The EPOCH 1000i features a standard combined A-scan and S-scan view that displays A-scan data from every angle between two user-defined start and end values. Each individual angle, collectively referred to as focal laws, can be selected to display a live A-scan enabling you to detect and characterize potential defects at multiple angles simultaneously using phased array imaging. When calibrating for gain and zero offset in phased array mode, the EPOCH 1000 i utilizes single-step procedures to calibrate across all focal laws. These automated calibration procedures allow you to capture peak amplitude or TOF/distance measurements from a single reflector across all the imaging angles (focal laws). The instrument then uses the captured amplitude or TOF/distance data to adjust the gain and zero offset at each focal law so that calibrated measurements are provided for every A-scan. The EPOCH 1000 i comes standard with DAC/TVG for all focal laws. This allows you to acquire a DAC curve, or create a TVG setup from known reflectors for all defined angles/focal laws at once. The instrument then allows you to edit individual points acquired during setup for precise DAC or TVG presentation. After completing the setup, you can use the S-scan image to detect potential defects at various focal laws. The DGS/AVG flaw sizing technique is included as a standard option in phased array mode. This feature uses the probe ID and wedge information to establish the DGS/AVG curve characteristics, and applies the curve at 0°, 45°, 60°, and 70° focal laws. The standard EPOCH onboard DGS/AVG menu and modified GAIN calibration tool allow for quick and easy setup. The option also provides an interpolated image TVG for easy detection across a given soundpath range. Weld Overlay is a standard inclusion on the EPOCH 1000 i , providing a visual reference of a weld profile on the S-scan display. This profile enables you to visualize the relative position of indications in relation to the weld geometry. A weld centerline cursor allows manual positioning of the overlay on the S-scan. The Weld Overlay enhances your ability to locate, characterize, and size flaws within the component during inspection, and improves reporting. The EPOCH 1000 i phased array mode includes a standard feature called Multi-Angle. This feature enables you to designate any three angles, or focal laws, available in the sector scan as "visible" focal laws. The A-scans from each of the three designated angles are overlaid, one on top of the other in the A-scan window, enabling you to view all three A-scans at the same time. Each individual angle is color coded for ease of use. This feature is perfect for inspectors using conventional sizing methods requiring evaluation at 45°, 60°, and 70°. Measurements gates can be displayed in True Depth mode on the Sector Scan, thus enabling you to acquire measurements from a constant depth area throughout the part, regardless of the focal law selected. This is particularly helpful when using the encoded C-scan option, as it enables you to collect information for one entire skip distance with a single gate position. The True Depth gates display as horizontal lines on the S-scan only; the A-scan view remains in Soundpath mode. The EPOCH 1000 i comes with an AWS D1.1/D1.5 weld rating calculator. 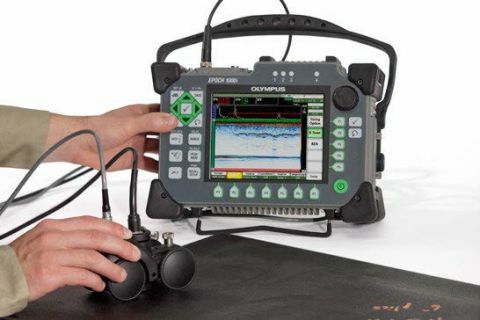 In conjunction with Olympus' AWS-rated phased array transducer, this enables you to use imaging capabilities for flaw detection while sizing flaws at 45°, 60°, and 70° using the conventional A-scan technique, and also view the D value for onscreen weld rating of any selected A-scan (focal law). This optional software feature expands the EPOCH 1000 i to a 16:64 element configuration and enables linear scans in addition to encoded or timed C-scans. Linear scans are collected using a probe with up to 64 elements, and a maximum active aperture of 16 elements. C-scan imaging is created by accumulating image data from the programmed linear scan or S-scan across a single-line scan axis. An encoder is required to track the position as the probe is moved along the scan axis. This encoded C-scan image collects both time of flight (TOF) and amplitude data from two independent measurement gates. The live A-scan is viewable during C-scan acquisition. Compressed A-scan images can be stored for all points on the C-scan, and can be reviewed along with the S-scan or liner scan from a particular C-scan location for basic visual analysis. Data source and type can be adjusted dynamically after the scan is acquired, and cursors are available for basic scan sizing. Additional color palettes are available for phased array image scans. These color palettes provide different color scales for use with varied applications, and can be modified to meet your specific needs. Watch the Encoded C-scan Feature video. Encoded or time based C-scans. Supports probes with up to 64 elements. Minimum scan resolution of 1 mm (0.040 in.). Compressed A-scan storage for all C-scan points. C-scan can be created from S-scan or linear scan. Encoding up to 3 m (118.11 in.) per scan (61 focal laws at 1 mm scan resolution). Image and A-Scan review for visual analysis using cursors. The EPOCH® 1000 i supports a new series of phased array probes to meet the demands of critical inspections. These probes include specialized probes for specific code compliance, and standard weld inspection probes, including removable or integral wedge phased array probes. Most common phased array probes with up to 64 elements are supported. The EPOCH 1000 i is compatible with all standard single element transducers in conventional mode. Switching between conventional UT and phased array inspection is as easy as pressing a button. The EPOCH 1000 i features a high-speed transition from UT to PA mode, enabling you to easily combine conventional UT and phased array inspections. The Mini-Wheel encoder can be used with the encoded C-scan option for the positioning and dimensioning of defects in the scan axis, and can synchronize data acquisition with probe movement. The Mini-Wheel encoder is waterproof and can be mounted onto the Olympus PA wedges using the included bracket kit. This miniature encoder is made entirely of stainless steel, and features sealed bearings for long-lasting smooth operation. The custom electronic circuit was designed for minimal noise induction. Waterproof (designed for IP68 rating). Double O-ring tire for better adherence. Sealed bearing long lasting smooth wheel rotation. Strain relief for cable protection. Two M3 threaded holes on top of the casing for rigid attachment. The EPOCH 1000 Series, as part of its high-level conventional UT performance, offers an encoded B-scan option that includes both single value and cross-sectional B-scan modes. This B-scan option features fast scanning speeds combined with fine scan resolution allowing for detailed scans while reducing overall scan time. EPOCH 1000 Series B-scan also allows storage of A-scans for all collected B-scan points for reporting or data validation at specific locations along the scan. Once a scan is stored, basic on-board analysis can be performed using sizing cursors on the scan image and calculated statistics from the thickness data. Cross sectional B-scans display an amplitude based image of thickness data over a scanned distance, rather than a single thickness reading at each transducer location. These scans, similar to phased array zero degree linear scans, allow visualization of flaws across the entire screen range, and are ideal for laminar flaw inspections in materials such as composites as well as base metal inspections. An encoder buggy, transducer cable are required in addition to the B-scan software and encoder cable listed below.